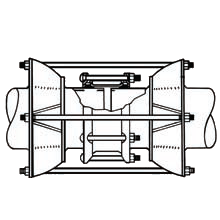 Restraining — Utility Supply (West) Corp.
Smith-Blair Pipe-Lock Joint Restraint Couplings are fabricated steel sleeve restraint couplings that can be used to connect and restrain plain end pipe to plain end pipe. 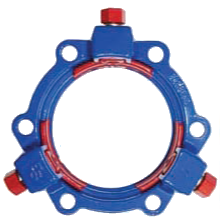 Smith-Blair Flange-Lock Joint Restraints restrain plain end pipe to plain end pipe and can join IPS PVC or ductile iron OD PVC to ductile iron or carbon steel. Smith-Blair Harness Assemblies should be used where calculations show the forces resulting from a lateral connection, change in direction of the pipeline, unstable soil, thermal expansion/contraction or other service conditions could cause the pipe to move out of the coupling. 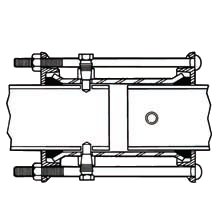 Smith-Blair Cam-Lock Joint Restraints save labor by providing superior restraint with fewer wedges and install on IPS size PVC without modifications. The Cam-Lock's lower bolt torque and wider wedges reduce pipe stress. Cam-Lock Features include color-coded nuts and wedges, epoxy coating, visible wedge engagement and longer T-bolts. Available in sizes 3" through 24". Smith-Blair Bell-Lock Joint Restraints provide a quick and efficient means of restraining hydrants, valves, pipe bells and fittings used in water and wastewater systems. Bell-Lock features include recessed shoulders for single wrench installation, compatible with standard MJ and some push-on style fittings. Available in sizes 4" through 12". Smith-Blair Anchor Studs are designed as an alternative coupling method to harness assemblies for applications where moderate longitudinal stresses are encountered. 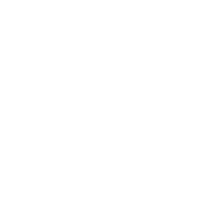 Smith-Blair EZ-W Restraint Couplings for water service are designed with push on gaskets and engineered to simplify installation, restrain the pipe joint and ensure a tight seal. 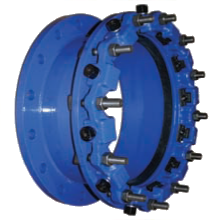 EZ-W Couplings can be used to connect IPS PE to steel pipes 1" through 12" diameters and ductile iron to IPS PE, PVC or steel pipe, 2"-8". Restraint Plates, Tie Rods and Nuts - For restraining flange to flange pipe.